This interesting surname is a patronymic form of the given name Harry, itself being a pet form of the personal name Henry, deriving from the old French "Henri" meaning "home-rule". The name first appears in England in its Latinized form "Henricus" in the Domesday Book of 1086. During the Middle Ages this name became enormously popular in England and was borne by eight kings, a record not equalled until the 20th Century (when Edward caught up). In the period in which the majority of English surnames were fashioned, a common vernacular form of the name was Harry. The surname is first recorded in the latter half of the 13th Century (see below). One Nicholas Herri, is noted in the 1327 Subsidy Rolls of Worcestershire and William Herry, appears as a witness in the Court Rolls of the Borough of Colchester in 1337. 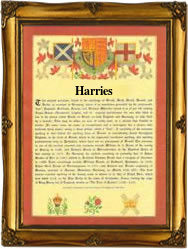 In the modern idiom, the surname has many variant spellings including Harry, Harrie, Harrhy, Harries, and Harriss. An interesting namebearer was Walter Harris (1647 - 1732), physician to King Charles 11 (1683), King William 111 and Queen Mary (1694). A Coat of Arms granted to the Harris families of Cornwall, Devonshire and Hertfordshire, is a black shield with three crescents and a bordure argent. A falcon rising ermine, beaked and legged gold, on the stump of a tree raguly, lying fesseways vert, forms the Crest. The first recorded spelling of the family name is shown to be that of John Hanry, which was dated 1273, in the "Hundred Rolls of Buckinghamshire", during the reign of King Edward 1, known as "The Hammer of the Scots", 1272 - 1307. Surnames became necessary when governments introduced personal taxation. In England this was known as Poll Tax. Throughout the centuries, surnames in every country have continued to "develop" often leading to astonishing variants of the original spelling.